The vertical stoarage tanks have a wide range of applications. These tanks are used for chemistry, horticulture and water treatment and in addition to all production companies that use chemcials during the production process. Made of impact resistant natural low density polyethylene (LLDPE) according to the rotational molding process, seamless, strain and break free. Extensive range: 10 models with manhole cover ø500 mm and capacity sizes from 850 to 10.000 liters. The tanks can be fitted with flange connections (filling, level, vent, suction and overflow), with both the suction and filling flanges being provided with pipes to the bottom. Usually the tanks are delivered together with a bin. 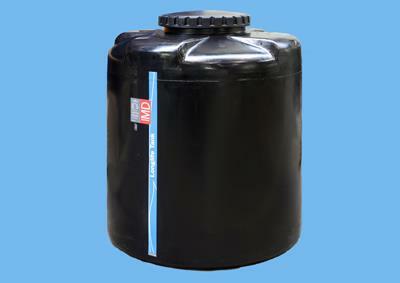 Besides the natural colour, also available in black for the storage of water. Other colours at extra cost also possible. At temperatures above 30 C or densities above 1.5 please consult us about the intended application. Tanks can be placed on a platform or concrete base. A compliant floor, which however has to be level, is also acceptable.